Want to be a part of a sugar revolution as big as tobacco was back in the 70’es? Then watch That Sugar Film when it shows in cinemas throughout the world over the next 6 months. Dr. Lustig started rocking the proverbial ‘sugar boat’ back in 2009 with his presentation Sugar: The Bitter Truth, David Gillespie raised the alarm as well in his book Sweet Poison and now That Sugar Movie is going global. It is going to happen, and it’s just the beginning. 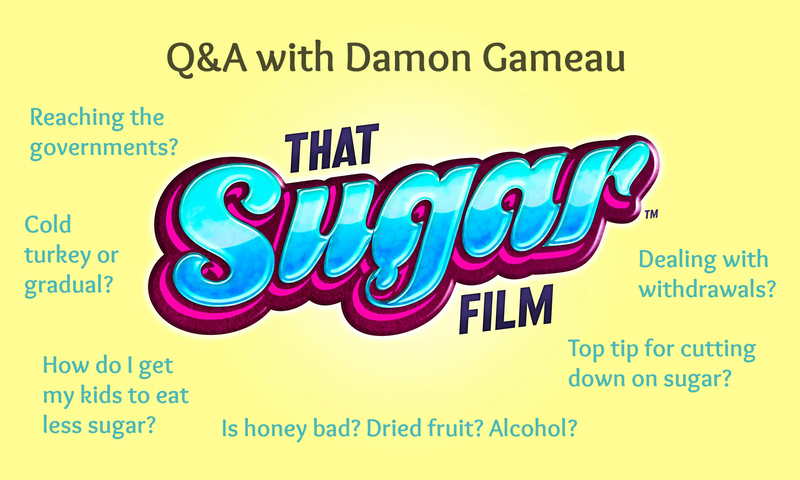 That Sugar Film – what is it about? Last week my husband and I were amongst the lucky people who got to watch the first preview screening of That Sugar Film in New Zealand. Having being immersed in this topic for over 3 years, I have to say that it was pretty spot on! It explains why sugar is worse than you thought (trust me, you will be surprised) and showcases real life examples from around the world. And, of course, how one man, Damon Gameau (eating a healthy diet, drinking no alcohol and taking no prescription medicine) reacts when subjected to 40 teaspoons of sugar per day over 2 months (similar to Morgan Spurlock in Super Size Me). Here is the twist though, Damon must only eat perceived ‘healthy’ food such as juice, cereals, muesli bars and low fat products. My favorite part? That this is a highly entertaining movie. I won’t lie and say I didn’t cover my face once, but it’s easy to watch, family friendly and humours. So, my dear friends, if you need to be convinced that sugar-free diets aren’t just ‘another fad’, watch this movie! (Opens in NZ cinemas May 7th, book tickets here, and will be touring South Africa, Europe and America in the following months). 1. What is your top tip for cutting down on sugar? Read labels. Understanding that 1 teaspoon is 4 grams. So, if you see a product which has 20 grams of sugar, you divide that by 4 and you then know there is about 5 teaspoons in that serving. Knowing that the companies are using a vast amount of different names for sugar, though they are catching on to this message, there are something like 60 different names for sugar, like evaporated cane juice, my favourite new one is ‘grape mist’. 2. Best tip for dealing with withdrawals? We now know that fats activate award centres in the brain, not quite as strong as sugar but in similar ways, I had avocado and a teaspoon of coconut oil with my meals. A nutritionist in Australia told me to use reversed psychology, if I had a craving have something really disgusting, like apple cider vinegar, so you brain says, well if you are going to give me that when I have a craving I’m not going to have a craving anymore, it’s a really good technique. 3. Cold turkey or doing it gradually? It depends on how much sugar you are having in your diet. For me I would say gradual, we have to be kind to ourselves. What worked for me was to have a lot of fruit in that transition period, it has a lot of sweetness to it but the fibre is protecting us from the influx of sugar. And your palate does adjust, for me it probably took about a week, everything tasted bland and like cardboard. But, then I started noticing the subtle flavours again, it’s quite an amazing moment, even to me, now, who drank two cokes a day, I find a banana almost too sweet, so you do get through it. 4. Sugar in alcoholic drinks? We know that a lot of the fructose is burned off in the fermentation process of alcohol. White wine, red wine is quite low in sugar. Dessert wine and champagne is higher in sugar and beer has a different type of sugar called maltose, so it obviously still affects the liver but you have to have a lot more of it to cause damage. Honey is high in fructose but if you are eating healthy, not having much sugar in your lives, a little honey is totally fine. I think we just sometimes go extreme. This sugar addiction has developed over 100 of years, it’s important to be kind to ourselves. If you have a little honey or maple syrup here or there, enjoy it. 6. Should we avoid dried fruit and certain high fructose fruits (as well as added sugar)? I think that fruit is very important, we know from studies that fructose is affected by the fibre, it slows down the metabolism in your body, it reacts very differently than of that sugar is removed and we have it like a free sugar. Dried fruit is an interesting one. We had a scene in the film that we took out where we took a child’s lunch box and counted out that there were 91 sultanas in there, and then I took 91 grapes and I tried to eat them all but I only got through about 30 of them, I just can’t, the fibre and water. But you can have all that condensed sugar in one tiny box and get that hit. It’s probably better for you than a Mars bar but be careful with the dried fruit. 7. My kids are so headstrong – how do I convince them to eat less sugary things? Avoid ‘cutting out’ or ‘removing something’ from the kids. You want to crowd the pantry with other things that are healthier, provide good options instead of taking something away. We have got a lot of recipes on our page that are almost a transition, so you can make banana and avocado smoothies that are still really sweet but it’s not a soft drink. There are ways of making them sweeter but still healthy too, almost like a transition phase. So there are just all these new foods ad they start loving it – there is also a free book you can download to help families, you are not alone. 8. How do you see the continuing effect of the movie and your own personal commitment beyond the film? We are carrying on the tour, South Africa, Europe and America. And, pitching to 300 philanthropists, we were able to raise enough money to develop a school study guide from grade 5 to 11 so they can do a whole term on just the topic. They get the book and there’s an app where you scan the bar-code, the sugar cubes drop out and tells you how much sugar is in that item. It’s great fun, great for Coca Cola too, the screen just fills up. And something very dear to me is that we have been able to raise money for the Mai Wiru (Good Food) Foundation, that’s the aboriginal community in the film, we have been able to re-employ John Tregenza that’s the man in the film, he started going up there again. We have sent nutritionists up there to train some of the aboriginal people and we are going to employ them to work full time in the store and they will show the other people how to shop, how to by lower sugar food. 9. We followed your ups and downs in the movie, not only the physical ones but also psychologically, those outbursts just seemed to become the norm? This is the conversation I would most like to have – we need to acknowledge the link between food and mental behaviour is just as important as the link between food and physical behaviour. There was a study on 800 kids in New York where they lowered their sugar intake and noticed enormous changes in their grades and behaviours. And there were schools in England and one here in New Zealand where they removed sugar and suddenly there were less detentions. It’s very real, it’s just going to take a really long time. We accept the physical aspect of it but the mental ones are going to take a bit longer. 10. What do we do to get this message about sugar though to the government? We have to remember that 40 years ago we were having the same chat about tobacco. That conversation had to start somewhere and that’s what the film has been doing. I think that scene with the Flintstones and the cigarettes get a laugh but I reason that in 40 years we will feel the same way about an athlete endorsing Gatorade to kids or Australian cricket captain is eating KFC. I hope we get to a point where we think ‘gee that was pretty irresponsible knowing what we know now. It is coming from a grass-root level, it’s people like you who go out and spread the message and share on social media etc. We can wait for the government if we like but it will take a really long time, we might as well do it ourselves, get moving, get active, and that’s what is happening. In Australia we see screenings now for medical groups and even some education departments, nurses etc. For example, next week we are screening for a private hospital, they are showing 400 nurses because they want to change the whole food in the hospital. In a prison 200 inmates are going to watch the movie because the nutritionists there wants to take away soft drinks because it affects their behaviour. It’s happening, and it’s happening without a government, it’s though the people. That’s what we can do for now and then, if there are votes in it, the governments will come on board. If you would like to see more articles like this and gluten, dairy and sugar-free recipes you can follow me here (via email, see top right on this page), on Facebook or Twitter.